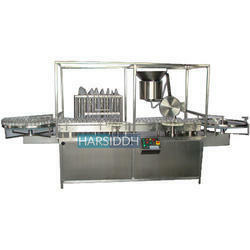 Prominent & Leading Manufacturer from Ahmedabad, we offer automatic liquid vial filling machine. We are a fastest growing manufacturer and exporter of Automatic Liquid Vial Filling Machine, which find application in the pharmaceutical industries. These Vial Filling Machines are globally acclaimed for their dimensional accuracy and capability to fill the vials perfectly and speedily. These machines consume less time and labor and offer hassle-free performance. We can also offer these machines according to specifications sent by clients.